The Gold Rush is a 1925 American comedy film written, produced, and directed by Charlie Chaplin. The film also stars Chaplin in his Little Tramp persona, Georgia Hale, Mack Swain, Tom Murray, Henry Bergman, and Malcolm Waite. Chaplin declared several times that this was the film for which he most wanted to be remembered. It received Academy Award nominations for Best Music and Best Sound Recording upon its re-release in 1942. Big Jim, a gold prospector during the Klondike Gold Rush, has just found an enormous gold deposit on his parcel of land when a blizzard strikes. The Lone Prospector gets lost in the same blizzard while also prospecting for gold. He stumbles into the cabin of Black Larsen, a wanted criminal. Larsen tries to throw him out when Jim also stumbles inside. 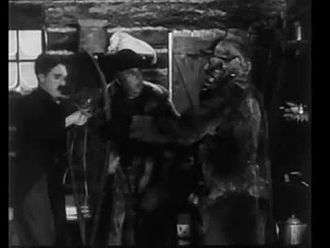 Larsen tries to scare both out using his shotgun but is overpowered by Jim and the three agree to an uneasy truce where they all can stay in the cabin. When the storm is taking so long that food is running out, the three draw lots for who will have to go out into the blizzard to obtain some food. Larsen loses and leaves the cabin. While outside looking for food, he encounters Jim's gold deposit and decides to ambush him there when Jim returns. Meanwhile, the two remaining in the cabin get so desperate that they cook and eat one of the Prospector's shoes. Later, Jim gets delirious, imagines the Prospector as a giant chicken and attacks him. At that moment, a bear enters the cabin and is killed, supplying them with food. After the storm subsides, both leave the cabin, the Prospector continuing on to the next gold boom town while Jim returns to his gold deposit. There, he is knocked out by Larsen with a shovel. While fleeing with some of the mined gold, Larsen is swept to his death in an avalanche. Jim recovers consciousness and wanders into the snow, but he has lost his memory from the blow. When he returns to the town, his memory has been partly restored and he remembers that he had found a large gold deposit, that the deposit was close to a certain cabin and that he had stayed in the cabin with the Prospector. But he does neither know the location of the deposit nor of the cabin. So, he goes looking for the Prospector, hoping that he still knows the location of the cabin. The Prospector arrives at the town and encounters Georgia, a dance hall girl. To irritate Jack, a ladies' man who is molesting her and pestering her for a dance, she instead decides to dance with "the most deplorable looking tramp in the dance hall", the Prospector, who instantly falls in love with her. After encountering each other again, she accepts his invitation for a New Year's Eve dinner, but does not take it seriously and soon forgets about it. While waiting for her to arrive to the dinner, the Prospector imagines entertaining her with a dance of bread rolls on forks. When she does not arrive until midnight, he walks alone through the streets, desperate. At that moment, she remembers his invitation and decides to visit him. Finding his home empty but seeing the meticulously prepared dinner and a present for her, she has a change of heart and prepares a note for him in which she asks to talk to him. When the Prospector is handed the note, he goes searching for Georgia. But at the same moment, Jim finds him and drags him away to go search for the cabin, giving the Prospector only enough time to shout to Georgia that he soon will return to her as a millionaire. Jim and the Prospector find the cabin and stay for the night. Overnight, another blizzard blows the cabin half over a cliff right next to Jim's gold deposit. The next morning the cabin rocks dangerously over the cliff edge while the two try to escape. At last Jim manages to get out and pull the Prospector to safety right when the cabin falls down the chasm. One year later both have become wealthy. But the Prospector was not able to find Georgia. They return to the contiguous United States on a ship on which, unknown to them, Georgia is also travelling. When the Prospector agrees to don his old clothes for a photograph, he falls down the stairs, encountering Georgia once more. After she mistakes him for a stowaway and tries to save him from the ship's crew, the misunderstanding is cleared up and both are happily reunited. Lita Grey, whom Chaplin married in mid-1924, was originally cast as the leading lady, but was replaced by Georgia Hale. Although photographs of Grey exist in the role, documentaries such as Unknown Chaplin and Chaplin Today: The Gold Rush do not contain any film footage of her. Discussing the making of the film in the documentary series Unknown Chaplin, Hale revealed that she had idolized Chaplin since childhood, and that the final scene of the original version, in which the two kiss, reflected the state of their relationship by that time; Chaplin's marriage to Lita Grey had collapsed during production of the film. Hale discusses her relationship with Chaplin in her memoir Charlie Chaplin: Intimate Close-Ups. Chaplin attempted to film many of the scenes on location near Truckee, California, in early 1924. He abandoned most of this footage, which included the Lone Prospector being chased through snow by Big Jim, instead of just around the hut as in the final film, retaining only the film's opening scene. The final film was shot on the back lot and stages at Chaplin's Hollywood studio, where elaborate Klondike sets were constructed. It earned United Artists $1 million and Chaplin himself a profit of $2 million. Variety also published a rave review, saying that it was "the greatest and most elaborate comedy ever filmed, and will stand for years as the biggest hit in its field, just as The Birth of a Nation still withstands the many competitors in the dramatic class." One might be given to expect wonders of Gold Rush burlesque with the old Chaplin at the receiving end of the Klondike equivalent of custard. But one is doomed to disappoint, for Chaplin has seen fit to turn on his onion juices in a Pierrot's endeavor to draw your tears.... Instead of the rush of tears called for, one reaches for his glycerine bottle.... We do not wish to deride Chaplin. He is as deft as ever and far and away a brilliant screen master. He has made a serviceable picture in "The Gold Rush" but it seems that he is not as funny as he once was. Nevertheless, The New Yorker included The Gold Rush in its year-end list of the ten best films of 1925. At the 1958 Brussels World Fair, critics rated it the second greatest film in history, behind only Sergei Eisenstein's The Battleship Potemkin. In 1992, The Gold Rush was selected for preservation in the United States National Film Registry by the Library of Congress as being "culturally, historically, or aesthetically significant". Chaplin biographer Jeffrey Vance considers The Gold Rush to be Chaplin's greatest work of the silent-film era. Vance writes, "The Gold Rush is arguably his greatest and most ambitious silent film; it was the longest and most expensive comedy produced up to that time. 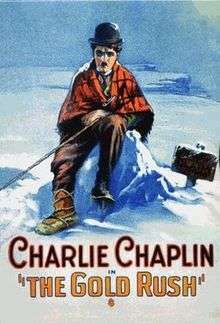 The film contains many of Chaplin’s most celebrated comedy sequences, including the boiling and eating of his shoe, the dance of the rolls, and the teetering cabin. However, the greatness of The Gold Rush does not rest solely on its comedy sequences but on the fact that they are integrated so fully into a character-driven narrative. Chaplin had no reservations about the finished product. Indeed, in the contemporary publicity for the film, he is quoted, 'This is the picture that I want to be remembered by.'" In 1942, Chaplin released a new version of The Gold Rush, modifying the original silent 1925 film by adding a recorded musical score, adding a narration which he recorded himself, and tightening the editing, which reduced the film's running time by several minutes. The film was also shortened by being run at "sound speed", i.e. 24 frames per second; like most silent movies, it was originally shot and exhibited at a slower speed. As noted above, Chaplin also changed some plot points. Besides removing the kiss at the end, another change eliminated a subplot in which the Lone Prospector is tricked into believing Georgia is in love with him by Georgia's paramour, Jack. The new music score by Max Terr and the sound recording by James L. Fields were nominated for Academy Awards in 1943. The Gold Rush was the first of Chaplin's classic silent films that he converted to a sound version in this fashion. 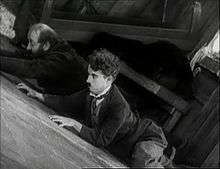 As revealed in the 2003 DVD release, the reissue of The Gold Rush also served to preserve most of the footage from the original film, as even the restored DVD print of the 1925 original shows noticeable degradation of image and missing frames, artifacts not in evidence in the 1942 version. In 1953, the original 1925 film may have entered the public domain in the US, as Chaplin did not renew its copyright registration in the 28th year after publication in accordance with American law at the time. As such, the film was once widely available on home video in the US. 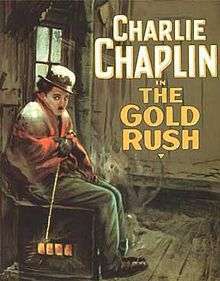 In the years since, Chaplin's estate has blocked the unauthorized releases of The Gold Rush in the United States by arguing that under URAA/GATT, the film remains under copyright in Great Britain. MK2 Editions and Warner Home Video currently hold DVD distribution rights. In 2012, both the reconstruction of the 1925 silent version and the 1942 narrated reissue version were released in both Blu-ray and DVD by the Criterion Collection. This set included a new audio commentary track by Chaplin biographer and scholar Jeffrey Vance. The "roll dance" that the Little Tramp character performs in the film is considered one of the most memorable scenes in film history, although Roscoe Arbuckle did something similar in the 1917 movie The Rough House which co-starred Buster Keaton. The bit was briefly homaged by Curly Howard in the 1935 Three Stooges film Pardon My Scotch. Anna Karina's character in Bande à part references it before the famous dance scene. In more recent times, it was replicated by Robert Downey Jr. in his lead role as Charles Chaplin in the 1992 Chaplin, which also briefly depicts the production of the film; Johnny Depp's character in the 1993 film Benny and Joon; Grampa Simpson in the 1994 The Simpsons episode "Lady Bouvier's Lover"; and by Amy Adams's character in The Muppets. The "hanging cabin on the edge of the cliff" sequence has been used in two Indian movies - 1990 Tamil comedy Michael Madana Kama Rajan and 2007 Hindi comedy Welcome. 1 2 Balio, Tino (2009). United Artists: The Company Built by the Stars. University of Wisconsin Press. p. 57. ISBN 978-0-299-23004-3. ↑ 1001 Movies You Must See Before You Die (in Swedish). p. 60. ISBN 978-91-46-21330-7. ↑ Mordaunt Hall (August 17, 1925). "The Gold Rush (review)". New York Times. ↑ "Film Reviews". Variety. New York: Variety, Inc.: 22 July 1, 1925. Retrieved November 13, 2014. ↑ "Critique". The New Yorker. New York: F-R Publishing Company: 17. August 22, 1925. ↑ Shane, Theodore (December 26, 1925). "The Current Cinema". The New Yorker. New York: F-R Publishing Company: 29. ↑ "25 American films are added to the National Film Registry". The Prescott Courier. December 7, 1992. Retrieved February 20, 2016. ↑ Vance, Jeffrey (2003). Chaplin: Genius of the Cinema. New York: Harry N. Abrams, pg. 154. ISBN 0-8109-4532-0. ↑ "The 15th Academy Awards (1943) Nominees and Winners". oscars.org. Archived from the original on 2011-11-07. Retrieved 2011-08-14. ↑ In 1959, Chaplin re-edited The Pilgrim as part of The Chaplin Revue, and in the 1970s, he re-edited, re-scored, and re-issued The Kid, A Woman of Paris, and The Circus. ↑ David P. Hayes (2007). "Music Synchronization - What the Courts Ruled". Copyright Registration and Renewal Information Chart and Web Site. Retrieved 2015-04-24. ↑ "The Gold Rush". The Criterion Collection. Retrieved 14 March 2016.